911uk.com - Porsche Forum : View topic - Widebody - Thoughts? 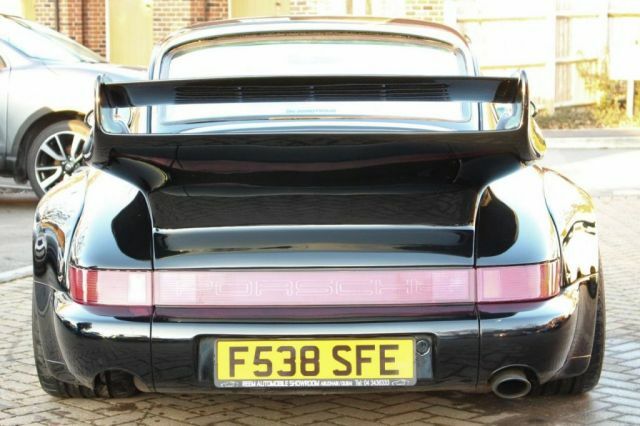 911uk.com Forum Index > 964 (1989 - 1993) > Widebody - Thoughts? It was originally red for sure. 993 C4 Coupe - 996TT Coupe - 3.2 Carrera Sport - 964 C2 Coupe. Wish list.... 997 GT3 comfort spec. I'm keen to know how one can be sure, based on these pics? I'm not challenging you, I honestly want to know. I will be viewing the car this weekend but I'm gathering info (and opinion) before I go. The chassis rail on the right of the picture is red. Above the engine sound mat is red. The Red cable across the top you refer to is the underside of the rear bulkhead. The underside of the rear bulkhead is normally pretty much covered up by the sound deadening material below it. The sound deadening material deteriorates over time, and tend to droop at the edge of the bulkhead lip, exposing the bulkhead metal. The bulkhead is painted the original factory colour during the production process. I.E. Guards Red. (the red bit you see). The plastic bit to the right you refer to is actually the rear chassis leg to which the rest of the car is welded in production. The tube coming from it with the yellow cap is the oil filler tube. This is welded to the right rear chassis leg during the production process. Again, this is sprayed the original body colour of the car during the production process. I.E. Guards Red. This is how I/we know the car was originally red. There is a white sticker on the inside cover of the service book, and an identical sticker on the underside of the front bonnet near the bonnet catch. (They should read exactly the same). These stickers have all of the build specification of each individual car. The paint colour identification code is also printed on this sticker. Quite often the sticker on the underside of the bonnet is removed when a colour has been changed, or the panel replaced. Also, the sticker will be missing from the inside cover of the service book if it is a duplicate service book. Just to put this to bed. What we have attempted to do is give you the benefit of our collective knowledge and experience. This knowledge and experience is quite comprehensive, and has most certainly come at considerable financial cost to the contributors of this forum and thread. The body mods and incomplete colour change suggests 'cost cutting' and potential covering up of nasties) This is not a good sign.We are merely bringing this to your attention, as you requested. 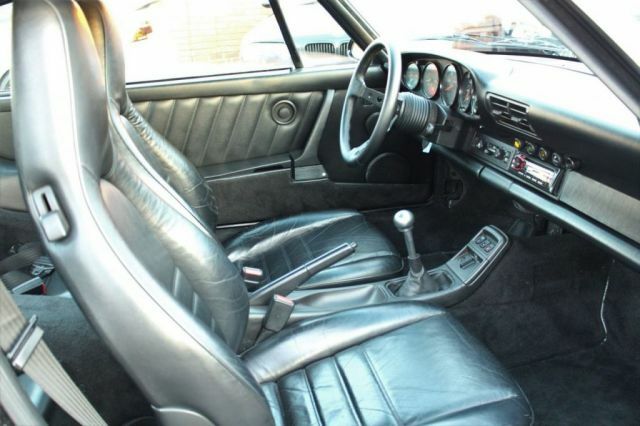 Personally, I have parts bills exceeding £20k in the 5 years of 964 ownership, and that is doing all of the work myself. I wish you all the very best with this car, and sincerely hope that it exceeds yours (and our expectations). Great info, thanks very much for taking the time to note that down for me. Will still give it a look but with extra open eyed approach. If I could get a deal there would always be the option of taking it apart and restoring it properly but I'll check out the history etc while I'm there. It's only 30 mins from where I play golf anyway. Backitoff has got it about bang on there i think. Every part on these cars cost a lot of money. Even down to clips, nuts & bolts. I have built The Red Baron pretty much from the ground up doing most of the work myself. I have a build cost folder into many, many, many thousands. Thanks. Worst case scenario, I get to see and drive a little bit of childhood fiction for real. Best case, I find something very nice to spend a little time (hard-earned) and effort on. For the record, I would probably only ever offer mid 30's on something like this but we'll see what happens! There have been a couple of 993's on here for low to mid 30's lately both having had money spent on them and look much much better value for your money than this car! I thought I would jump in here to give my opinion for what it is worth. Personally I would not worry about it having been resprayed. Purely on appearance I like it - Cup type steering wheel and black seats (as opposed to ghastly grey), arch extensions and rear spolier. As long as these are in keeping with that model I cannot see the problem. To further put this into perspective before I bought my 996 GT3 I posted on 911UK and there were also a lot of dissenters. It was originally silver but was resprayed (door stays and under the hood/boot but not a complete engine out full shell respray) in Riviera Blue. Specialist Cars of Malton (SCoM) gave it a full bumper to bumper 12 month warranty and I have not had any major problems with it. Condensors under the warranty and bushes since in the 15,000 miles and four years plus of ownership. This also despite various track days at the Nordschleife. 911UK are generally quite a staid bunch in the nicest possible way. I think it probably relates closely to the average age of a 911 owner . There is an immense amount of expertise here but they dont like deviation very much. You only have a look at ELA's (CLR) many posts on his modified 997 GT3 RS. Heaps of praise and respect shown but as soon as his car was up for sale everyone was quick to say how modifications will put buyers off. Clearly a modified car has a limited market but I think you should buy for yourself not others. I can further draw a parallel between the GT3/RS whose price/value is mileage sensitive leaving owners to think twice about driving them. All I will say is you are a long time dead. SCoM have a good reputation but I have never heard of Ecplise in my many years of being on PH and 911UK (as well as CSL Register, BM3W et cetera et cetera) so as you have said a independant inspection is wise. Finally I should also add that I know very little of the older models 993, 964, 930 et cetera). 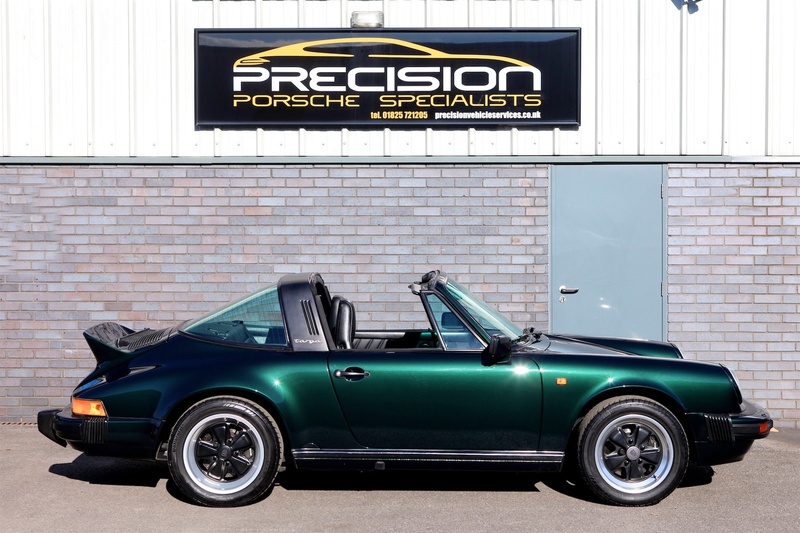 I did have a quick look at a Targa at Precision Porsche that had been modified and I thought was richly priced at £80,000 . I look forward to your update on this thread. ........ There is an immense amount of expertise here but they dont like deviation very much. You only have a look at ELA's (CLR) many posts on his modified 997 GT3 RS. Heaps of praise and respect shown but as soon as his car was up for sale everyone was quick to say how modifications will put buyers off. Probably not the best example you could have used Pip'. Yes that is the one. I probably did not make my point very well with all my waffle. My point was that everyone (well lots of people ...) were quick to praise the work ELA did but nobody was interested when it came to selling even though it was underpriced, dropping once at least. Clearly if the original poster is buying to sell maybe he should look elsewhere but if he is buying to enjoy go in eyes open but apart from getting it checked and negotiating on price he need not dismiss it just because of an 'incomplete' respray. Recent full-out engine overhaul by ourselves including new Turbo and heat light modifications. (and heard) to be appreciated. and restoration history. Please phone for more details. Being sold on SOR on behalf of one our customers. I did pop in to see this car, but it wasn't there. It is kept off-site in a dry storage bubble. The cars that were on-site were almost all in terrible cosmetic condition. Lot's of unwashed, cobweb covered cars and used machinery that just looked tired. I wasn't too impressed. The salesman was friendly, but he had to make some calls to find out more about the 964. He dug out some history, but it was a replacement book, no mileage or service detail and no original spec / options sticker. He said it would be for sale at over £80k if it did have those things. I disagreed in as friendly a manner as I could. He confirmed it was originally red. I'm going to see it again when it is on-site. I'd like to drive it and if it looks and feels ok I would get a full inspection and valuation done in order to negotiate hard on the price. I could always drop the engine and get the bay re-sprayed to match the body and do some engine stuff while it's out. I'm not really pressing this, but I'll look when he tells me he has it on-site and see what happens. Based on the original op's last comments I'd bet my eye teeth it's a shi**er. How/why else would that kind of set up have a car like that for sale? Me too. But sometimes, just sometimes, you find a good one at these places. I get the feeling it is owned by a friend of the salesman and isn't in a rush to sell. It's possibly not sold because it's not there. I have nothing to lose and there are no rose tinted glasses thank you very much. I wouldn't buy a *****. Never lost more than £5k on a car in all my days, not about to start. 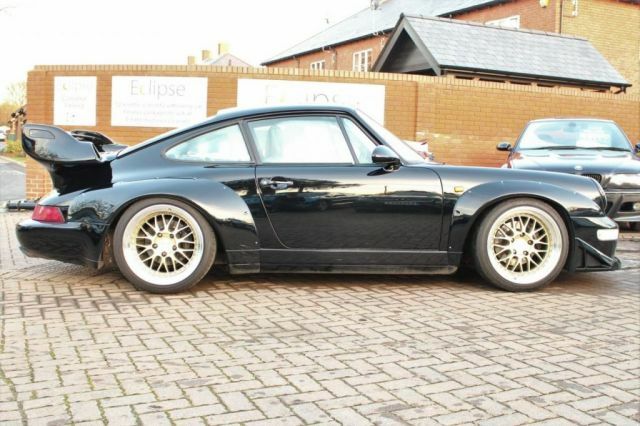 Not my cup of tea due to the 993 bolt-on arches and GT2 rear wing but could be a base for a decent project if you wanted to convert to a 964 WTL. As it is, I think it's way too expensive, its been advertised for ages. I'm not even sure what I'd offer - probably mid-30's. As for mileage, there are sites out there that will tell you the last recorded mileage of Shaken (Japanese MOT) or at auction if you provide the chassis number - not ideal but would give an indication if its had a haircut. It's a bitsa, a Frankenstein car. Who would fit 993 bolt on arches to a 964? I'll tell you who, Someone who wants a widebodied car but knows how hard it is to do it properly. I'd value it way less than a good straight standard one. In fact I wouldn't even value it. I'd run away. Just buy a standard one. They look fine, if a little slab sided but are nice and nimble and characterful. Run away and never look back. Oh and a single exit exhaust out of a dual exit bumper doesn't scream "meticulous owner". I could not live with details like that. Pekingprawn can you contact me via email or PM. I may have something for you. I've tried to PM you but the message is not sending.